We’ve all seen a Pixar megahit Up and we’ve all had the same idea – “impossible, but what if”. 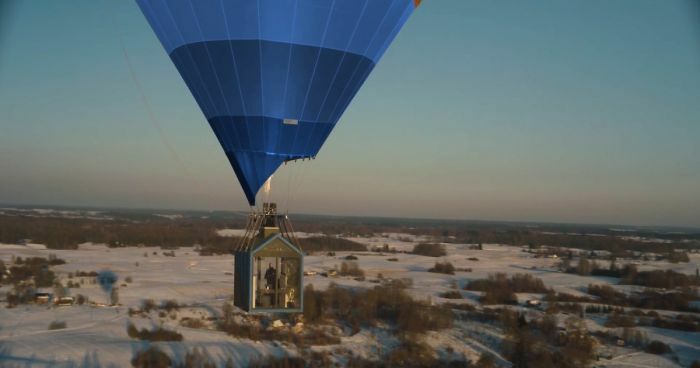 Well, a telecommunications company with the help of the university scientists from Lithuania took it one step further and got an actual house with people in it into the air, just to prove a point. The house, built specifically to be flown by an air balloon, weighs 1.5 tons, is 7 square meters big and more than 3 meters tall. The electric sockets were functioning, as well as there were plants and furniture inside the house. It took a team of 20 engineers, designers and balloonists nearly 5 months to build the house from scratch and fly it over Lithuania. One of the head engineers for the project, Mykolas Bistrickas, said that what might be the first case of the air balloon traveling home ever, was as challenging as you could expect. “There is no emergency button, no brake for the house flying in the air. 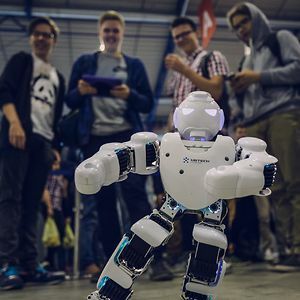 There could be no emergencies, so we had to plan for everything, we had to test everything ten times and then do it again”, says the engineer of Vilnius Gediminas Technical University. It took 9,000 cubic meters for the hot air balloon to lift, which was, with full gear and people inside, a 2 tones cargo. 7 ballooners worked on piloting the balloon that glided above the ground for about 90 minutes and reached the height of 200 meters. Tele2 telecommunication company financed the project to illustrate their new internet service LAISVAS (FREE), that allows using a modem in any location within the country. So technically, you could use your house internet even in the middle of the forest – as proven by the fact that Arnoldas Lukosius, an expert who sat inside the home, used it while flying over one of the biggest lakes in Lithuania. “Our goal was to prove that we can now use the fast internet not only all over Lithuania, but above it too”, claims Mindaugas Savickas, the head of marketing at Tele2. The two pilots laugh that it was extremely unusual to have a two-tone cargo beneath their feet while flying. Also, when operating a house in the air, landing is much more difficult than lifting it up there. In fact, while landing the pilots intentionally hit a small tree just to slow the home down before reaching ground. “We had a light shock when we found out we had to lift real estate into the air. And construct it too, in a way that would fit a camera crew inside. All while flying! And it must look like a real house too! In the end, we weren’t scared of failing or of any dramatic landing – if we had been, we wouldn’t have flown”, says Vytautas Samarinas, who operated the air balloon.